You might think that chia pudding is only for breakfast or snacks, but this recipe takes chia pudding to a new level of flavor, texture and elegance. 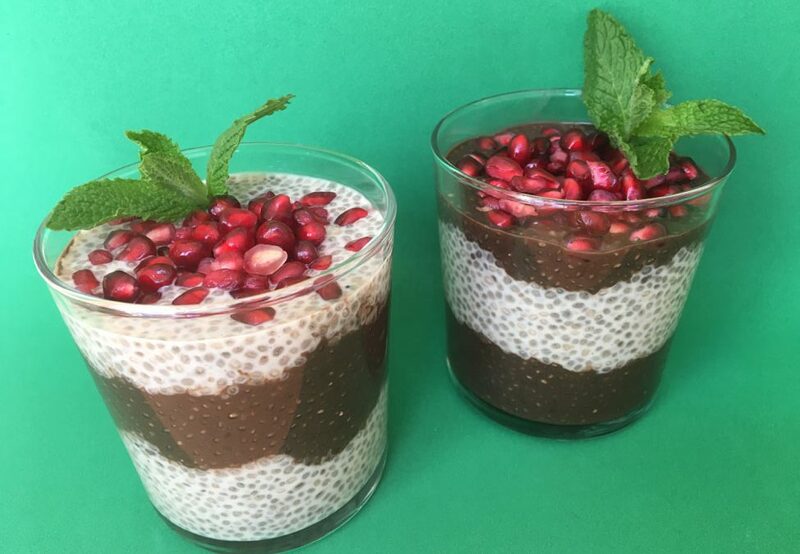 The layers of chocolate and vanilla look pretty in a glass serving dish, and the pomegranate seeds are packed with tart sweetness that brings the humble chia seed to new culinary heights. Chia seeds are super simple to use and are an excellent source of protein, healthy omega-3 fats, dietary fiber, vitamins, minerals and antioxidants. Their health benefits come mainly from their high omega-3 count which is beneficial for the prevention of diabetes and cardiovascular diseases. They are also loaded with phytochemicals and flavonoids, both of which can help prevent cancer and autoimmune diseases. Pomegranate seeds are another seed loaded with health-promoting nutrients. They are anti-inflammatory, promote cardiovascular health and are so filled with antioxidants that they are considered a super food. Dark Chocolate is considered a longevity food because of its anti-inflammatory, antioxidant and cardiovascular benefits. On top of that, it is a delicious tasting mood enhancer. 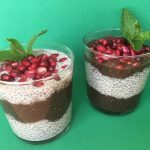 How to hack chia pudding: Chia seeds are super sticky once they hit liquid. After much trial and error, I have come up with a fool proof method for making chia pudding. I put all ingredients into a one-quart mason jar with a metal whisk ball from a blender bottle. I shake vigorously and place in the refrigerator. After 15 minutes I do this again. I then let it sit overnight and remove the blender ball before serving. The blender ball keeps the chia seeds from sticking together and emulsifies the pudding. You might think that chia pudding is only for breakfast or snacks, but this recipe takes chia pudding to a new level of flavor, texture and elegance. Chocolate Chia Pudding: Place all ingredients in a jar with a metal whisk ball and shake until well blended. After 15 minutes repeat shaking to make sure all seeds are incorporated into liquid mixture. Refrigerate overnight. Keeps for 3 days. Vanilla Chia Pudding: Place all ingredients in a jar with metal whisk ball and shake until well blended. After 15 minutes shake again to make sure all seeds are incorporated into liquid mixture. Refrigerate overnight. Keeps for 3 days. Remove blender balls from chia pudding mixtures. Select small clear glasses or bowls. Starting with the chocolate chia pudding, place 1/4 cup or less, of pudding in the bottom of a clear glass or bowl, then add a 1/4 cup of vanilla chia pudding on top of that, finish with a layer of chocolate chia pudding. Do 2 parfaits in this order and 2 parfaits starting with vanilla pudding, then adding chocolate pudding and finishing with vanilla. Top parfaits with a layer of pomegranate seeds and a sprig of fresh mint. While chia pudding makes a fun dessert with benefits, it also makes a healthy breakfast. Chia seeds are a good source of essential fatty acids, fiber and protein. I recommend making the parfaits in small glasses because they are rich and filling.